Mish's Global Economic Trend Analysis: When Will Housing Bottom? On the basis of mortgage rate resets and a consumer led recession I mentioned a possible bottom in the 2011-2012 timeframe. See Housing - The Worst Is Yet To Come for more details. Let's take a look at housing from another perspective: new home sales historic averages and housing from 1963 to present. 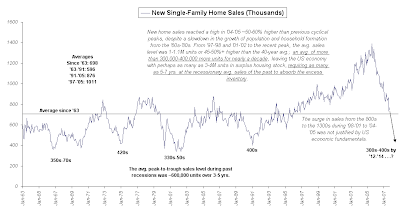 New home sales reached a cyclical high in 2004-2005 approximately 50-60% higher than previous peaks.This happened in spite of a slowdown in population growth and household formation as compared to the 1960-1980 timeframe. From 1997-1998 and 2001-2002 to the recent peak, the average sales level was 1.1 million units, or 45-50% higher than the 40 year average. This translates to an average of 300,000-400,000 excess homes for nearly a decade, and arguably as many as 3-4 million excess homes. Such excess inventory may require as many as 5-7 years at recessionary average sales to absorb this inventory. The following charts are from a friend who goes by the name "BC". Here is the flashback of the week with thanks to Toddo on Minyanville for the link. Toddo's comment: "Don't you feel better knowing Bernanke's on the case?" My comment: Was that a blatant lie or is Bernanke the dumbest PhD in history? Also note his timing. Bernanke made that statement right as the bubble was busting. Housing peaked the summer of 2005. The excesses of the current cycle have never been greater in history. 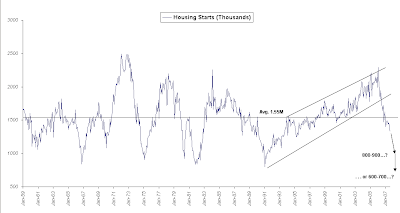 The odds are strong that we have seen secular as opposed to cyclical peaks in housing starts and new single family home construction. With that in mind it is highly unlikely we merely return to the trend. If history repeats, and there is every reason it will, we are going to undercut those long term trendlines. There will be additional pressures a few years down the road when empty nesters and retired boomers start looking to downsize. Who will be buying those McMansions? Immigration also comes into play. If immigration policies and protectionism get excessively restrictive, that can also lengthen the decline. Finally, note that the current boom has lasted well over twice as long as any other. If the bust lasts twice as long as any other, 2012 just might be a rather optimist target for a bottom.